A breathing star: one thing Kepler finds other than exoplanets! Title: Detection of high-degree prograde sectoral mode sequences in the A-star KIC 8054146? 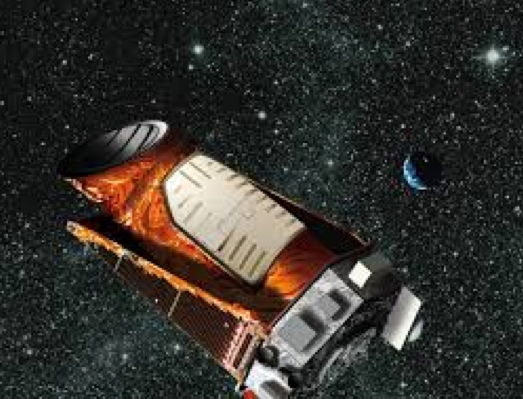 The Kepler satellite is well-known for studying exoplanets: planets orbiting stars other than our Sun. But what you may not have known is that the mission has also yielded many new insights on stars themselves. In particular, data from it has allowed Breger, Lenz, and Pamyatnykh to detect the “breathing” of a star: pulsations of the star in and out driven by gravity and pressure. Artist’s rendering of Kepler telescope, from irfu.cea.fr. The authors examine the Delta Scuti star KIC 8054146, an A star that seems to have its equator roughly facing us. An A star is, for those of you who remember the famous mnemonic “Oh Be A Fine Girl Kiss Me Like That”, one of the hotter stars (much hotter than our Sun, which is a G star). A stars are typically around 7500 K, and so would look bluer than our Sun. Delta Scuti gives a bit more specificity on the category of star: as with many sub-categories of star, the name is after the first example of the sub-category. Delta Scuti stars’ defining characteristic is that they have both radial and non-radial pulsations. The radial ones are when the whole star expands or contracts coherently; non-radial means some bits are moving inwards while others are moving outwards. 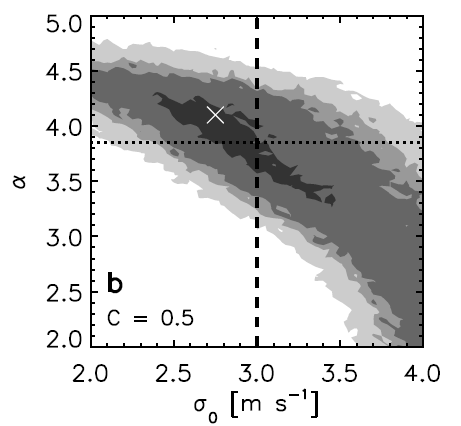 The modes detected in today’s paper are non-radial: some bits of the star are moving inwards while others move outwards. They are also of so-called “high degree”. What does that mean? Well, first check out the figure below, and then come back here! Pulsations are described by three numbers, two of which describe the number of times the oscillation has a null (is zero) and the third of which describes how many of these nulls are meridional (lie along a meridian of the star). For more detail, see . . . “High degree” in this paper means that l is large, and l is the number of lines on the star’s surface along which there is zero radial motion. One way to get one’s head around this is to imagine the Earth’s surface, and think of it as though it is a snapshot of how an oscillating star might look at one instant in time. Mountains are bits of the star moving outwards, valleys below sea level bits moving inwards, and anything at sea level is not moving. Drawing an arc on the Earth’s surface that only covered bits at sea level would be one node; the number of such arcs would be l. Of course, the Earth’s surface is irregular, with mountains and valleys more or less randomly spaced—and it is here the analogy breaks down, because on pulsating stars the nodes (at least in theoretical models) are more regularly spaced. If this doesn’t already seem a little complicated, there’s more! Stars rotate, and Delta Scuti stars tend to do so rapidly. This flattens them out into oblate spheroids: imagine a beach ball if you sit on it: the equator bulges out. This bulging in turn changes the force of gravity locally (there is more mass below you at some points on the star but less at others), and that in turn changes the effective temperature of the star. These changes in turn impact the oscillations the star undergoes. Further, the oscillations actually travel around the star: that is what “prograde” means in the paper’s title—that the oscillations are traveling around the star in the same direction the star is rotating. This means that it is hard to disentangle the movement of the oscillations around the star from the rotation of the star itself. However, from looking at the pattern of different frequencies observed, the authors are able to disentangle these two movements, and determine the frequency of the oscillations’ motions around the star. 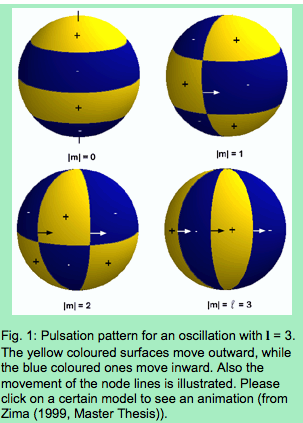 Illustration of the pulsations under discussion here; yellow bits move outward, blue inward, where they meet is a node. the black and white arrows indicate how the pulsations move circumferentially around the star. From http://www.univie.ac.at/tops/dsn/texts/nonradialpuls.html. The authors conclude by pointing out that theoretical considerations mean the modes they claim to have detected should be among the easiest modes to detect. This, in combination with the high resolution of Kepler, means that they can have some confidence that their detection is a real one. Fitting the frequencies and amplitudes of the modes they detect allows them to derive a mass of 1.8 solar masses for the star and a rotation velocity of 272 km/s. These results are useful because Delta Scuti stars are, much like Cepheid variable stars, used as standard candles, so any improvement in our understanding of the physics that drives their period-luminosity relation is great! In particular, one of the biggest unknowns in most Kepler-detected stars is their mass: if this technique can be extended to other stars in the Kepler field to determine mass, then it will be a huge boon,with the potential to even helping Kepler’s studies of exoplanets, too. I continue to be amazed by your intelligence and insightful, scientific mind. Great discoveries are in your future! Are we familiar with other similar stars such that we can compare this mass result to some kind of baseline?